Like everything she does, Martha Stewart rugs are expertly crafted from the best materials; few names carry as much of a reputation for beauty and quality. Stewart's line incorporates florals and other transitional prints, and even a few unique takes on traditional designs for formal spaces. Gorgeous florals and botanicals are mainstays of Stewart's designs. Her Hand-Tufted line includes many different florals and botanicals, all suited for a particular scheme or season. Poppies, palms, geraniums, and ferns bloom across these hand-made pieces. Each style is hand-crafted from high quality wool, giving the rugs their signature colorful quality. The Kalahari rug from the Hand-Tufted collection offers a contemporary take on animal print. The leopard spots that dance across the Kalahari are bold yet understated, and they are available in several neutral tones. 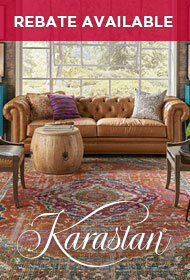 Again, each Kalahari rug is hand-crafted from fine wool for a pleasing texture and deep color. Another animal print rug, the Machine Made Reptilian, is made from soft viscose in subtle neutrals including creme and taupe. The Hand-Tufted line also includes casual stripes, homey plaids, and architectural mosaic prints. One interesting offering from the Hand-Tufted line is the traditional-style Damask rug. A subdued version of traditional damask prints, this design is more textural than it is graphic. Crafted from a blend of wool and viscose, the Damask is luxurious, soft, and shimmering. 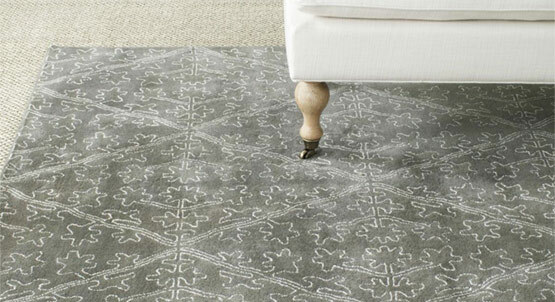 Another rug inspired by traditional designs is the Natural Cotton Terazza. Like the Damask, the Terazza features a subtle, understated graphic. The Natural Cotton line is made from soft cotton using methods that give its rugs a very low pile. Terazza is available in fresh neutral colors that won't overpower your interiors. Martha Stewart rug designs demonstrate an eye for fine details, and the Petite Point Grove exemplifies this. Small, botanical details come to life in this tapestry-like rug, made with small stitches from 100 percent wool. The Hand-Tufted Autumn Woods rug features similarly intricate botanicals. Every Martha Stewart rug is simply beautiful, encapsulating the simplicity and luxury we have come to associate with Martha's name.